We are excited to have Kellie Johnson join us today. Kellie describes herself as a “quiet member” of a team of women that we love to share time in ministry with called Living Free Friends. We are so thankful that she is sharing with us and trust you will be blessed as we discover that in God’s presence, we are secure. As I answered the phone at my office, I could hear the shakiness in my mom’s voice. “I’m fine, I’m fine. No need to panic…” she said. She always worries about others more than herself. Her tone spoke volumes to me and began to prepare me for what the next 24 hours would look like. Her recent lack of balance had caused her to take a bad fall during the night. She lay in the floor for hours, knocked out cold. Once my father discovered her battered body that morning, he got her to a hospital. By the end of the day, it was determined that the cancer she had fought so hard the year before had planted itself in her brain, causing her balance to be unstable. Her pelvis had been cracked and her shoulder now had two fractures from the fall. What stage was the cancer? What was I going to do? How was I going to help my mom in the best way possible? I wasn’t sure what my role would be. Have you ever felt like your world was spinning out of control and you were just along for the ride? Did it make you feel nauseous? Dizzy? God’s word tells us that He has us surrounded. Each side is protected. Even our top. When you feel as if your circumstances are pulling you forward so quickly that you can’t keep up, He has you hemmed in from the front. When you feel as if you’ve just been cold-cocked in the kisser and you’re struggling to stay upright, He’s got you hemmed in from behind. When you feel vulnerable to the storms that come in this life, exposed and afraid, He is a covering, keeping you safe. His hand is upon you. When we are shaken, His presence will keep us secure. We have been sewn up and stitched inside the powerful, holy protection of the Creator of all. And when we need to be held tight, held down, held upright, and even held together…He’s got us. 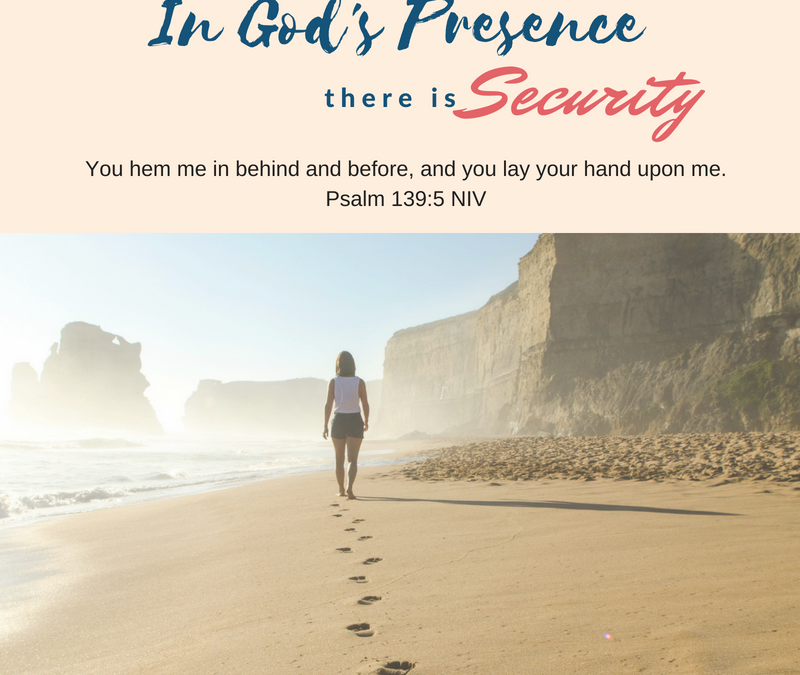 In His presence we find security. According to verses 1-5, how well does the Lord know you? Verse 2 tells us that God “perceives my thoughts from afar”. Do you find comfort in knowing this? Why or why not? In verses 7 the psalmist asks, “Where can I go from your Spirit? Where can I flee from your presence?”. The next verses the psalmist lists various places he is considering. List those in your notebook. Read verses 13-18 again. Underline anything that stands out to you. Do you find security in knowing that God thinks of you? Has there been a time in your life, like Kellie’s, when you needed to be consumed by the securing presence of God? Is that time now? Write a prayer thanking God for His security. Join us tomorrow as we discuss how we find purpose in God’s presence. During the last 9 years that my daughter, my only child, has not spoken to me I have been so comforted by the security I have in Jesus. It didn’t start that way, deep depression came first, followed by the overwheming presence of God and his deep love for me. Each day I can live and move knowing God is fighting this battle in the spiritual realm and I can rest assured that he loves me and is our God who brings reconcilliation. I too see a connection between His comfort and security. I think that is why “hide me beneath the feathers of your wings” is special to my heart. It sounds comforting and secure. Nancy, I will pray for these relationships to be restored. I, like you, trust that God is a God of reconciliation and restoration. I’m so very thankful that He brought you from the pit of depression. He is so very good to us. Thank you for sharing your heart with us today. “When you feel vulnerable, exposed, afraid…..His. Big. Hand.” Powerful! And so reassuring! Thank you Kellie! These are words I need to take to heart!. We are also thankful for these reassuring words! Thank you for encouraging others, Cindy. Cindy, I’m a visual gal, when I’m feeling rattled, I think of this. Thank you for your encouraging words today.